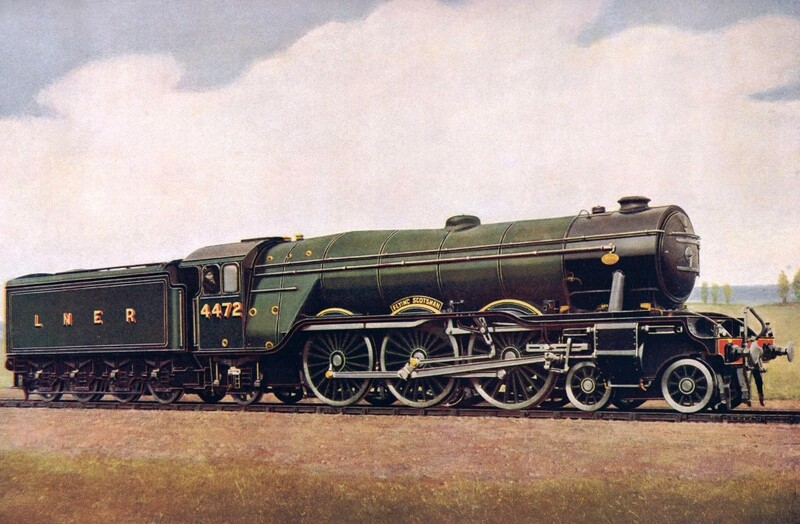 Flying Scotsman is arguably the most famous steam locomotive in the world, most people have heard of the name but do they actually know why it is so famous? With the locomotive about to start running in the UK again, after almost 10 years undergoing restoration, we take a look at the real reasons why so many people around the world have heard the name Flying Scotsman - but don't really know why - and how she continues to make headlines to this day. 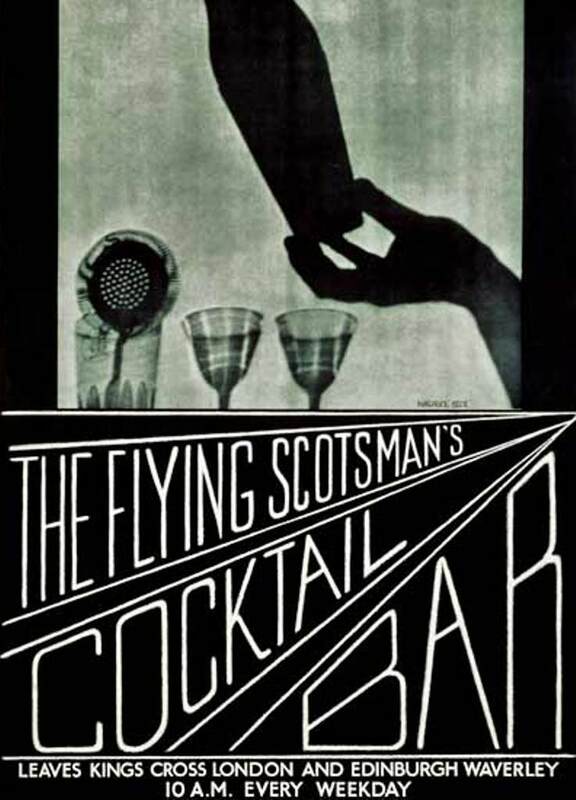 The Flying Scotsman is the name of both a train service in the United Kingdom and a notable steam locomotive that hauled the train service with the same name - just to confuse people. The service itself is an express passenger train that has been running between Edinburgh and London - the capitals of Scotland and England respectively - since 1862. It is currently operated by Virgin Trains East Coast. 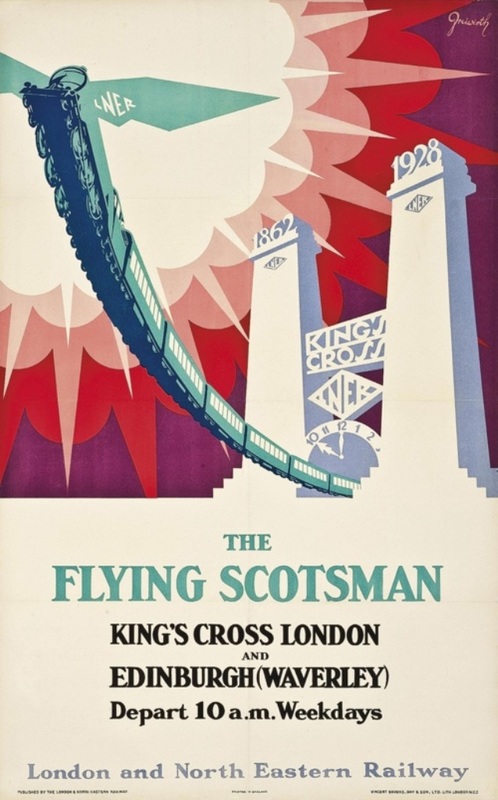 The Flying Scotsman was the services nickname until 1924 when it was officially designated The Flying Scotsman. To further publicize the launch of this re-invigorated service with its new name, five Gresley A1 Class express locomotives were built by the LNER (London & North Easter Railway) to pull it - they were modified to allow them to haul the train from London to Edinburgh without having to stop - the one selected to haul the inaugural run on 1 May 1928 was (surprise surprise) the one named after the service. The locomotive Flying Scotsman hauled the inaugural Flying Scotsman train 392 miles (631 km) from London to Edinburgh in eight hours non-stop. The service then entered record books as the world's longest scheduled non-stop run by a train. 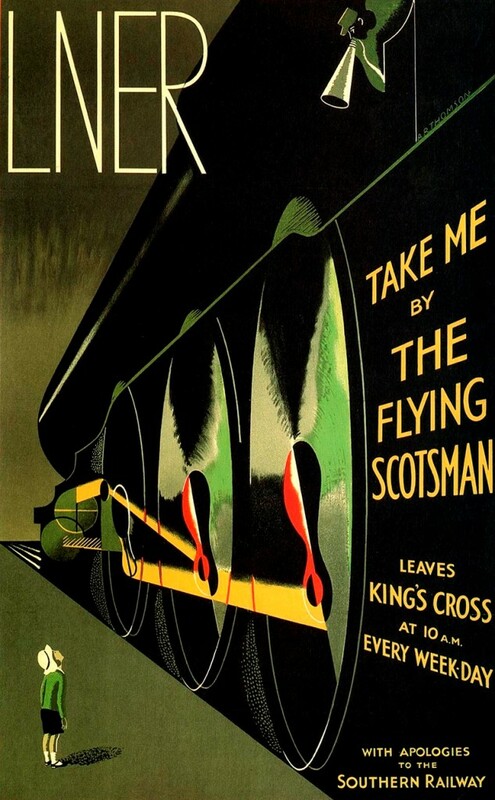 Ingenious marketing strategies and publicity stunts pioneered by the LNER in this period also contributed to the services fame and it began to hold a prestigious place in the minds of the British public. 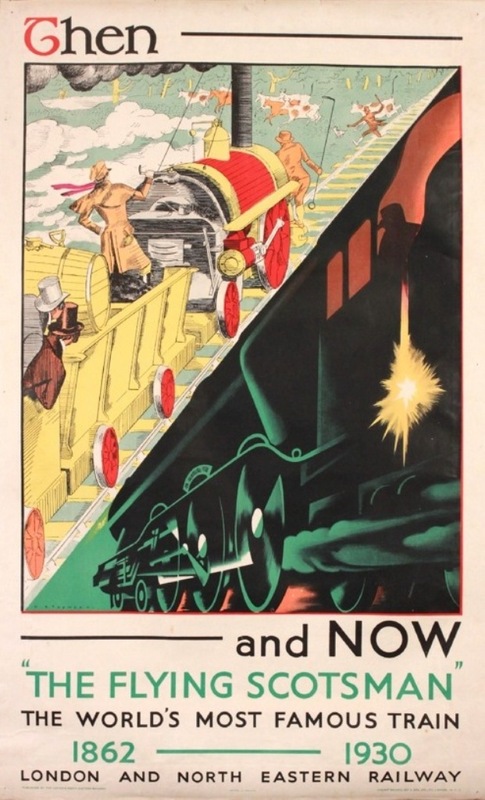 Every time they walked into an LNER station they were besieged by stirring posters such as the ones below. This is where the fame of the locomotive herself, began to eclipse the fame of the service. Being named after its flagship journey, the LNER began to use the locomotive as a massive publicity machine and poster boy. It represented the company at the British Empire Exhibition at Wembley in 1924 and 1925 - being put on display in front of 27 million visitors. The following year the locomotive appeared in a major motion picture entitled 'The Flying Scotsman'. On 30 November 1934, driven by Bill Sparshatt and running a light test train, the locomotive became the first steam locomotive to be 'officially recorded' at 100 mph (160.9 km/h) and she became a world record holder for speed - causing the LNER publicity machine to go into overdrive once again. The locomotive was officially retired from revenue earning service with British Railways in 1963, but its use as a publicity machine didn't stop for retirement. Every owner from 1963 to the present day has decided to keep the locomotive running rather than as a static exhibit - to do this they've needed money and keeping it famous keeps it in money. It was bought by railway preservationist Alan Pegler. 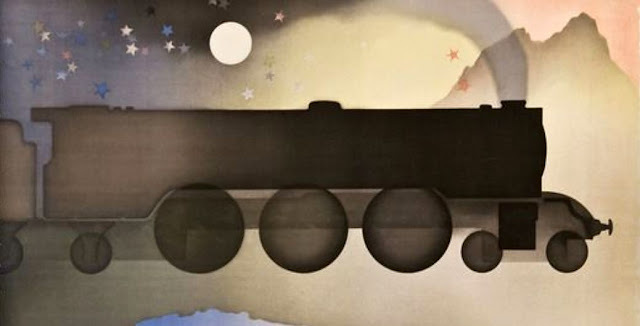 He restored her to something closely resembling her 1930s condition, and famously took the locomotive on an extensive and highly publicized tour of the United States. Financial issues meant that Pegler had to sell the engine to British businessman William McAlpine for £25,000 after nationwide fears that it might be permanently stuck in America - or worse - scrapped. 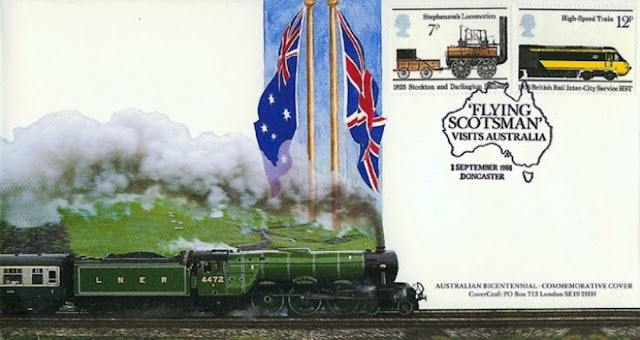 Flying Scotsman came home via the panama canal and was repaired, in 1988 she made a trip to Australia to take part in the countries bicentennial celebrations. Whilst there she achieved many more much made-of records. She again made the longest ever non-stop run by a steam locomotive, travelling 422 miles and her sea voyage to Australia and return made her the first steam locomotive to circumnavigate the globe. A few owners later and due to high running costs she was put up for sale again in the late 1990s. After a high-profile national campaign she was bought in April 2004 by the National Railway Museum in York, and she is now part of the National Collection. After 12 months of interim running repairs, it ran for a while to raise funds for its forthcoming 10-year major overhaul. 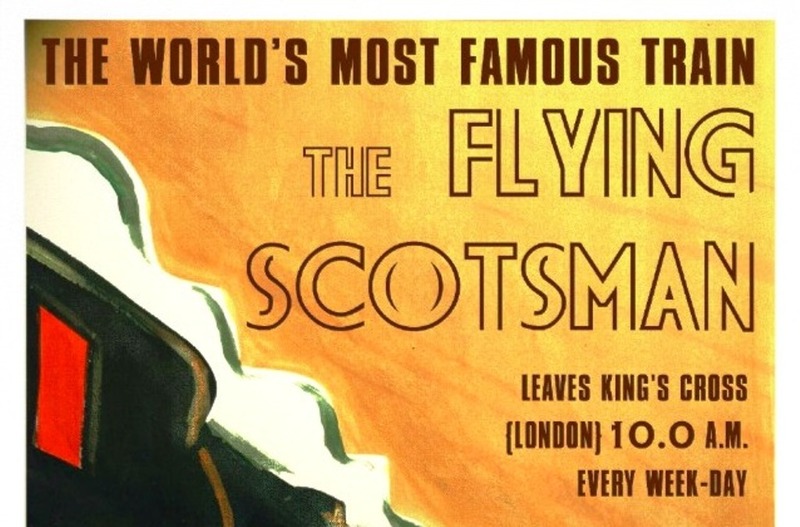 A lifetime as a poster-boy, a huge publicity machine and a series of stunts and records over a long period of time have led to the name Flying Scotsman becoming one of the most famous in world railway history. Perhaps the most remarkable thing about this fame is that there is no simple accounting for it. There is no one feat, achievement or event making the Flying Scotsman famous that can be summed up in one 'media friendly soundbite'. Yet the locomotive has undoubtedly achieved the status of 'national treasure'. This year the locomotive returns - to run on the mainline under its own power once again after a 10 year restoration. In true Flying Scotsman style, the manner of her return and its cost has generated enough publicity to rival its fame in any other time period - and in some ways it easy to see why. Having been purchased back into public hands for the sum of £415,000, a further £365,000 from Sir Richard Branson, a £1.8m grant from the National Heritage Memorial Fund, and a 10 year overhaul that was probably not much cheaper - can we put a price on a national treasure? And is running it really preserving it? Perhaps in an age where passionate enthusiast in the UK are raising funds to successfully build new steam locomotives, resurrecting classes and types that have been extinct since modernization in the 1950s and 60s, is it time to build a new Gresley A1 to take over the role of the travelling publicity machine? 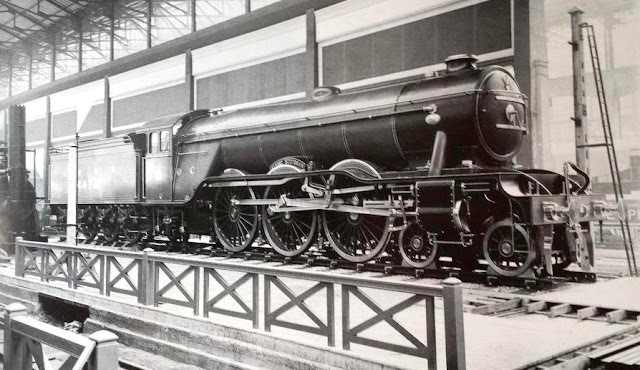 And give the old girl, Flying Scotsman herself, a long awaited rest - restored faithfully to how she looked in a pioneering time period and proudly displayed in one location for millions to come and appreciate like she was at the Empire Exhibition? HOW SEXUAL WAS WEIMAR GERMANY? Cabaret dancers in Berlin, 1928. THE OLDEST POLICE FORCE IN THE WORLD?